Most new construction homes have standard size door openings for one- or two-car garages. However, if you need a non-standard or custom design, or are purchasing a Carriage House style door, we will need to know the measurements of your garage. The information requested below is necessary to assure a proper selection of a new Raynor quality garage door. Note: Standard Lift doors require a minimum of 12" of over door height. Not enough headroom? Don't worry. Raynor's Low Headroom Front Mount Springs package reduces the height requirement to 8-1/4" of over door height, while Low Headroom Rear Mount Springs require as little as 4" (plus 2" w/motor operator). Note: A minimum of 3" side room is required with all models. Standard Lift—door height + 26"
Low Headroom Front Mount Springs—door height + 20"
Low Headroom Rear Mount Springs—door height + 29"
These minimum requirements are for the door only. Door openers may require additional backroom. Note: Obstructions are defined as entry doors or other objects that will interfere with the garage door track or the operation of a garage door. The nearest obstruction may be something such as pipes, support beams, heating ducts, lighting, etc. 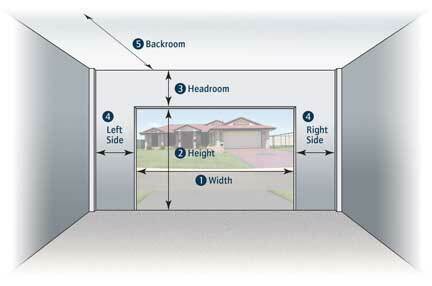 Obstructions must be taken into consideration in the headroom, sideroom, and backroom measurements.